Designed for bus operators who want drivers to record the daily vehicle inspection in a separate book from the hours of service logbook. This is a carbonless (NCR paper) two-part form with 31 sets per book. 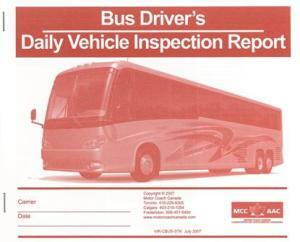 It includes a page with instructions for drivers as well as the mandatory General Bus Inspection Schedule 2 and the (Optional) Motor Coach Inspection Schedule 3.